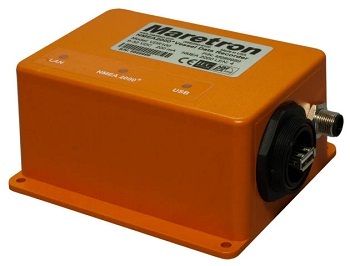 Maretron's Vessel Data Recorder (VDR100) is used to record messages transmitted from every product interconnected on the vessel's NMEA 2000® network. Each message is stored using solid-state memory technology with simple data retrieval via a removable USB flash drive (purchased separately). Depending on the chosen USB flash drive memory size, a year or more of data can be stored. And you never have to worry about losing the most recent data because the VDR100 uses a circular buffer where the oldest data is overwritten only after the entire memory is filled. Recorded vessel data can be used in many ways including performance analysis, vessel tracking, preventative maintenance, network diagnostics, warranty incident, and accident investigation, all in an effort to reduce operating cost and improve safety. As an example of how the recorded data might be used, consider an NMEA 2000® fuel flow monitor plugged into the network, which will provide a complete record of how much fuel was used and how fast it was used. With a GPS antenna/receiver plugged into the NMEA 2000® network, you will have a complete record of where the vessel has been including its speed and course over ground. Analyzing and graphing recorded data is done using a spreadsheet program like Microsoft® Excel®. Simply remove the USB flash drive and plug it into a PC or Mac and run Maretron's free extraction software (N2KExtractor™). Choose any or all of the recorded data including the associated dates and times and the program will create a comma delimited file (.csv) that can be read into a spreadsheet for graphing or any other type of data analysis. With the VDR100, you have a complete record of all the information produced by NMEA 2000® products connected to the vessel's network. And because the VDR100 is engineered and manufactured to the highest standards (IEC 60945 Maritime Navigation and Radio Communication Equipment), your data is safely protected in a compact waterproof housing. The USB Flash Drives are supplied by the user. Depending on how much data you wish to record without overwriting older data, the following table can be used to determine the capacity of the USB Flash Drive you need. These figures are estimated assuming a 25% loaded system (approx 463 frames/second).